Firm, ripe tomatoes. Golden corn. Fragrant basil. Juicy peaches. Nothing compares with the bounty of summer when colors, flavors, and aromas are at their peak and cooking is easier than ever. Fresh, ripe produce is so tasty and perfect on its own that creating a terrific summer meal can be stress-free, delicious, and fun. In Summer Gatherings, award-winning cooking instructor Rick Rodgers has compiled his favorite simple summer recipes that make the most of the season's flavors. Purposely casual, stripped to their essentials, these recipes are uncomplicated by elaborate sauces or fussy garnishes, focusing instead on the fruits and vegetables that make summer cooking what it is. With Watermelon, Tomato, and Mint Salad to Fried Stuffed Zucchini Blossoms; Soft Shell Crab BLT Sandwiches; Chocolate Cherry Parfaits; Grilled Chicken with White Rosemary Barbecue Sauce; Risotto with Tomatoes, Basil, and Ricotta Salata; and Cantaloupe Ice Pops, Rodgers will help you take full advantage of summer's bounty. 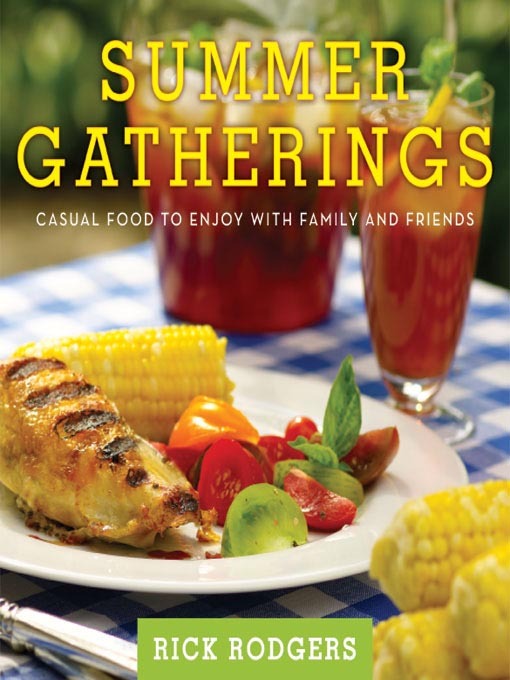 From family cookouts to neighborhood block parties, from picnics on the lawn to picnics at the beach, the appetizing recipes and photographs in Summer Gatherings are guaranteed to satisfy and inspire all season long.